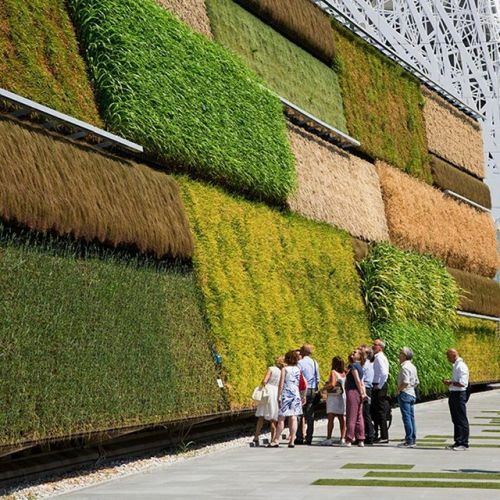 “The Israeli pavilion at @expo2015milano features a striking vertical field, which uses innovative irrigation methods — a reflection of the environmental attitudes at this year’s fair. The theme of @expo2015milano, which runs through October and includes 54 national pavilions, is “Feeding the Planet, Energy for Life.” It is billed as “a laboratory of innovation” on “sustainable development, food security and quality in the production chain.” But a visitor will also come across prominent vendors like McDonald’s and Coca-Cola there. @samuele_pellecchia photographed @expo2015milano on assignment for @nytfood.” By nytimes on Instagram.